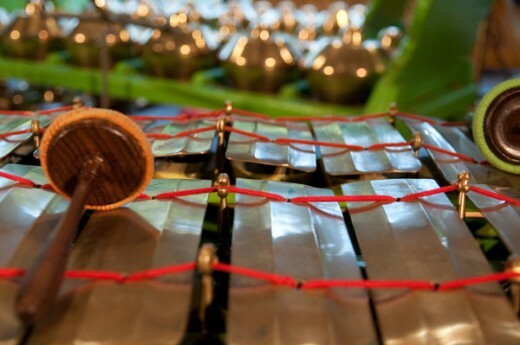 Join music, dance and shadow puppet master Sutrisno Hartana in hands-on workshops exploring the instruments of Alligator Joy, a bronze gamelan from Central Java. Discover the intricate layering of rhythmic patterns, improvisation and performance rules for each instrument to create ensemble-based music of infinite depth and shimmering beauty. Sutrisno Hartana is an arts educator, ethnomusicologist, researcher of shadow puppet theatre (Indonesian wayang kulit) in a global context, and a Javanese performing artist (dalang, gamelan musician/composer). He has completed his doctoral degree in Art History and Visual Studies at the University of Victoria in Canada (read his abstract here). He holds an MA in Ethnomusicology from the University of British Columbia. As a Javanese performing artist, he graduated with his bachelor degree from the Indonesian Institute of Arts in Yogyakarta, Java. In 2004, the King of Paku Alaman granted him the title “Mas Lurah Lebda Swara” making him a court musician at the Paku Alaman Palace in Yogyakarta, Indonesia. He has toured, performed and taught internationally in both traditional and contemporary performances throughout Asia, Europe, and North America. Sutrisno has taught at the School for the Contemporary Arts, Simon Fraser University, and the University of British Columbia, in Vancouver, BC, Canada. He has also taught at Ningbo University in China. Alligator Joy Gamelan. Image courtesy of Tony Rief.